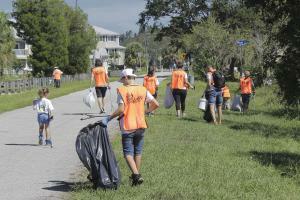 CLEARWATER, FLORIDA, USA, November 8, 2018 /EINPresswire.com/ -- On Saturday September 29th, an eleven-man Way to Happiness Association of Tampa Bay volunteer team took the continuing issue of littering to heart cleaning up 45 lbs. of trash on the Way to Happiness-adopted Clearwater mile of the Pinellas Trail. The volunteers geared up with the needed supplies and equipment at their Clearwater office on Fort Harrison Avenue and then hit the trail picking up cans, bottles, and cigarette butts to name just a few of the items that were thoughtlessly discarded.